If you're after a casual yet seriously stylish look, consider pairing a tobacco double breasted blazer with black sunglasses. These pieces are super comfy and look great when paired together. 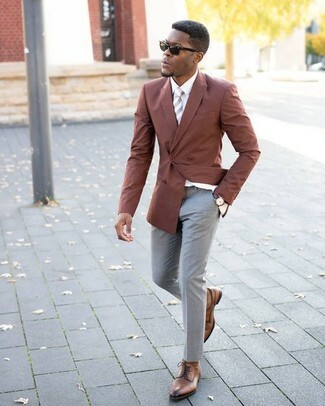 Grab a pair of brown leather derby shoes for a masculine aesthetic. 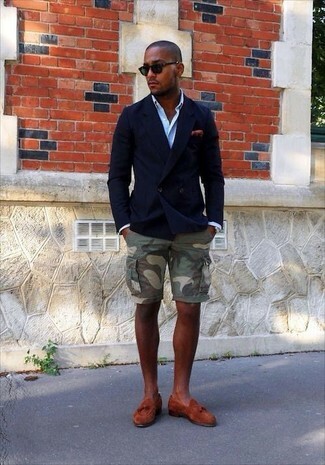 If you're searching for a casual yet stylish look, marry a navy double breasted blazer with black sunglasses. As well as very comfy, both of these garments look stunning when paired together. You could perhaps get a little creative in the footwear department and spruce up your outfit with tobacco suede tassel loafers. 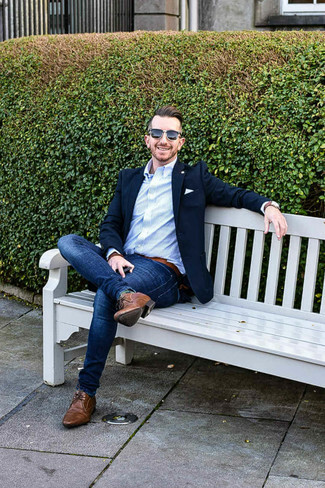 If you're all about relaxed dressing when it comes to your personal style, you'll love this stylish combo of a navy blazer and Cartier santos sunglasses. A pair of brown leather desert boots will bring a strong and masculine feel to any outfit. 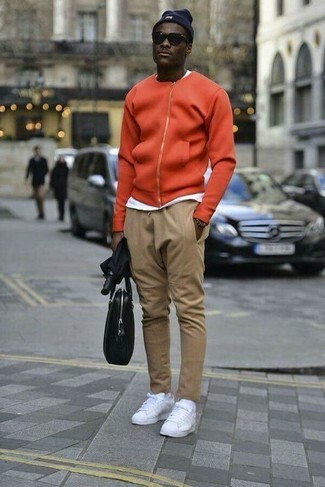 If you prefer relaxed dressing when it comes to your personal style, you'll love this on-trend pairing of an orange bomber jacket and Cartier santos sunglasses from farfetch.com. Spruce up your ensemble with white leather low top sneakers. If you're on a mission for a casual yet seriously stylish getup, try teaming a dark brown suit with Cartier santos sunglasses from farfetch.com. Both of these garments are totally comfortable and they will also look stunning when paired together. You could perhaps get a little creative when it comes to footwear and lift up your getup with dark brown leather oxford shoes. 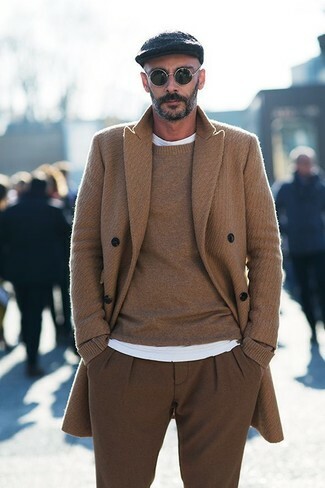 We all ensemble for comfort when it comes to dressing up, and this combination of a camel overcoat and Cartier santos sunglasses is a perfect example of that. If you're a fan of relaxed dressing when it comes to fashion, you'll love this simple combination of a grey chambray long sleeve shirt and Cartier santos sunglasses. To add elegance to your ensemble, complete with white leather low top sneakers. 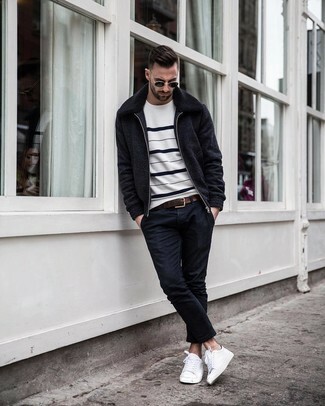 A black wool bomber jacket looks so casually dapper when worn with black sunglasses. Show off your sophisticated side by rounding off with white canvas low top sneakers. 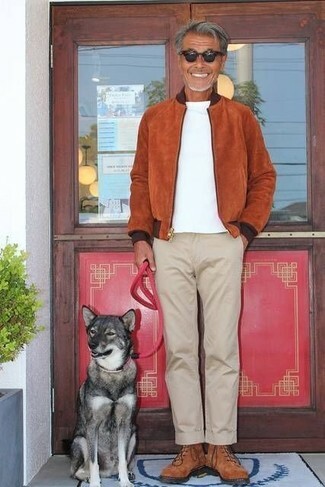 We all look for comfort when it comes to dressing up, and this combination of a tobacco suede bomber jacket and Cartier santos sunglasses is a vivid example of that. Channel your inner Ryan Gosling and grab a pair of brown suede high top sneakers to class up your ensemble.